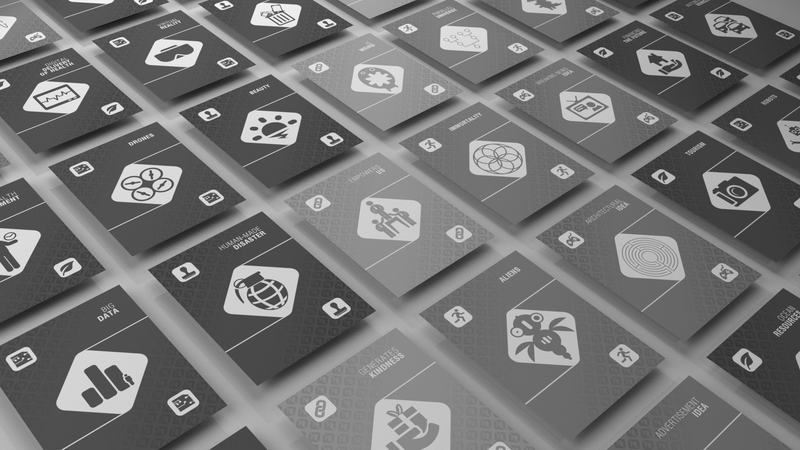 Gerenwa GmbH distributes the FutureDeck® card decks and applies the unique FutureDeck Intellectual Property incubation process, the latter which turns the seemingly threatening ambiguity of digital change into a quest of exploring opportunities – we call this Game Design Thinking. Commencing with a set of cards and play rules, and facilitated by one of our amazing playmasters (all of whom have somewhat convergent backgrounds), we take clients on an audited journey from ideating to roleplaying to rapid, iterative prototyping, incubating and user testing patentable Intellectual Property, thus shaping up what can become an innovation strategy. Clients including Daimler IT Sales & Marketing, Mercedes me, Mercedes-Benz Developers, Daimler HR, Fresenius, EvoBus, Deloitte & Deloitte Centre for the Edge, and the University of St Gallen’s Executive School of Technology, Management and Law have co-invented and experimented with stories from the future, whilst casually imagining, pitching and prototyping new digital services and products and lifestyles – using the FutureDeck, you, too, can empower intrapreneurs to exercise digital leadership and reflective foresight, and can inspire an out-of-the-box, collaborative, future-facing, reflective mindset in tomorrow’s entrepreneurs and digital citizens. Read this short article on LinkedIn and have a look at below’s flowchart to learn more about the FutureDeck innovation process. How could we play together? The FutureDeck has been developed by gerenwa’s Managing Director, Prof Dr Steffen P Walz, originally under the moniker Deck Future Australia. We are playing it with clients – and for ourselves. Inquire today how we together could boldly play where no one has played before, and let us start your and your organization’s FutureDeck quest. The price for one FutureDeck is €39.90 + shipping. DE €2.60 | AUS, NZ, USA, EU & REST OF WORLD: €3.45. Unfortunately we are sold out! We are currently producing new cards, so please return soon or e-mail us if you want to purchase some more cards. Thank you very much for your patience and we are sorry for any inconvenience.